About grief and loss… yet funny. Lee Chandler (Casey Affleck) is a solitary, reserved and withdrawn janitor who is forced take care of his teenage nephew following the death of his brother, Joe (Kyle Chandler). Lee works in the Boston suburbs and is mostly silent but something bubbles just below the surface as he lets his fists do the talking at the local bar. It is evident that he is punishing himself for a past transgression. Upon his brother’s untimely death, Lee is shocked to find out that he has been named the sole custodian of his teenage nephew, Patrick (Lucas Hedges). 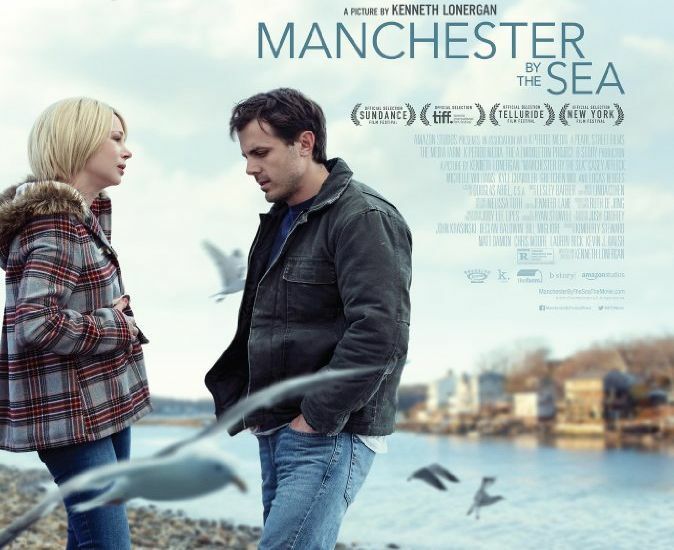 He takes leave from his job and reluctantly returns to Manchester-by-the-Sea to deal with Patrick’s care and in doing so is confronted with his past that he has tried to escape from. Patrick is a spirited young man whose interests are no different from any of his counterparts: obsessed with hockey, his rock band and the carnal pursuit of his two girlfriends. However, Patrick is far from a caricature. He is troubled with the loss of his father but it has not fully registered yet. For a man who hardly expresses himself verbally, Lee is portrayed by Affleck in a manner that makes it abundantly clear how much pain and hurt he is harboring. Affleck has almost specialized in playing characters that are tormented or troubled from within and express themselves non-verbally. His work has not gone unnoticed in his prior films: Gone Baby Gone, Interstellar and most notably The Assassination of Jesse James by the Coward Robert Ford. In this outing, quite simply, he is superb. Lee is a hollow man destroyed by a tragedy he holds himself responsible for. His way of dealing with his grief is seeking punishment while almost everyone around him wants to forgive him. The movie uses flashbacks to show his earlier personality during happier times where he is a happy and loving family man. It draws an interesting contrast as the current time is set in winter with its harsh elements at display while the flashbacks are almost entirely set in bright, sunny New England summers. Ken Lonergan is a remarkable director who captured grief, sibling bond and a troubled father-figure very well in his first outing, You Can Count on Me. He is very much in command of his material and steers clear of cinematic pitfalls and presents a relatable portrait of everyday life and grief. He uses a background of New England where one can sense the salt in the air and the language (scripted by Lonergan) is equally salty. He draws a solid performance from the supporting cast with Kyle Chandler as Lee’s deceased brother and particularly Michelle Williams as Lee’s ex-wife who draws a stark contrast between her current and flashback scenes. Her scene with Affleck towards the end of the movie is a powerful one displaying the prowess of the two performers. For a topic that could be very depressing on screen, Lonergan manages to infuse a good bit of humor especially in the interactions between Lee and the teenage Patrick. Lonergan wisely avoids a typical Hollywood ending even though the story could be concluded with a stereotypical catharsis and closing the package with a nice bow on top. He chooses instead to opt for a more practical and relatable ending which, in my opinion, does more justice to the characters he has built over the duration. This will certainly be on the Oscar watch for 2016 with Casey Affleck as the lead contender for Best Actor and possibly other nominations as well. Affleck’s performance is deserving of the Academy’s attention and accolades. Manchester by the Sea is one of the best films of the year and well worth your time. Hopefully we won’t have to wait this long again for Lonergan’s next outing.